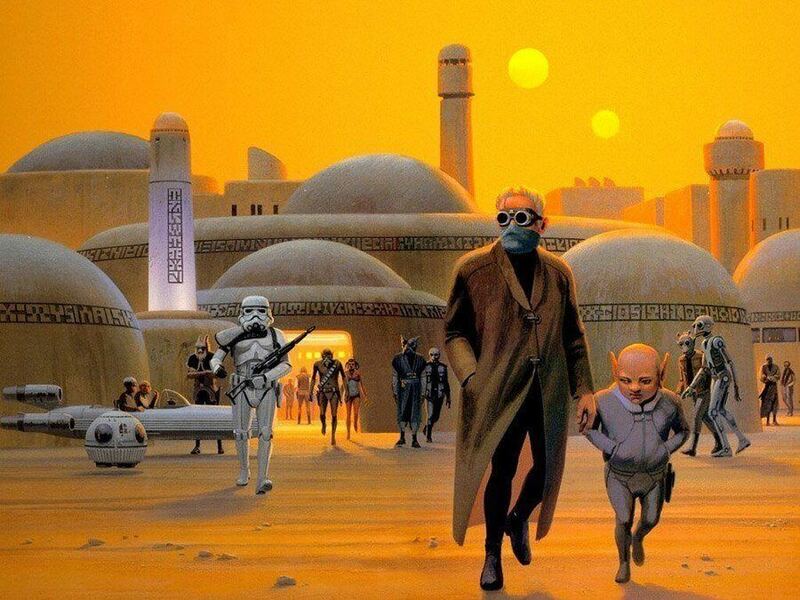 George Lucas may have directed the famed Star Wars series, but the true vision came from the mind of Ralph McQuarrie. Images like this of the droids in the desert of Tatooine are instantly recognizable from the film. With the seventh film in the Star Wars saga growing ever closer, buzz continues to grow. Rumors have swirled about that J.J. Abrams has gone back to the original concept art for his own inspiration, and as a result interest in the artist behind them is renewed. Han Solo’s ship the Millennium Falcon docked at Mos Eisley Spaceport. Ralph McQuarrie, the man behind the creation of Star Wars’ iconic look, has inspired generations of kids as well as other artists. Even after his death in 2012, his influence is undeniable. 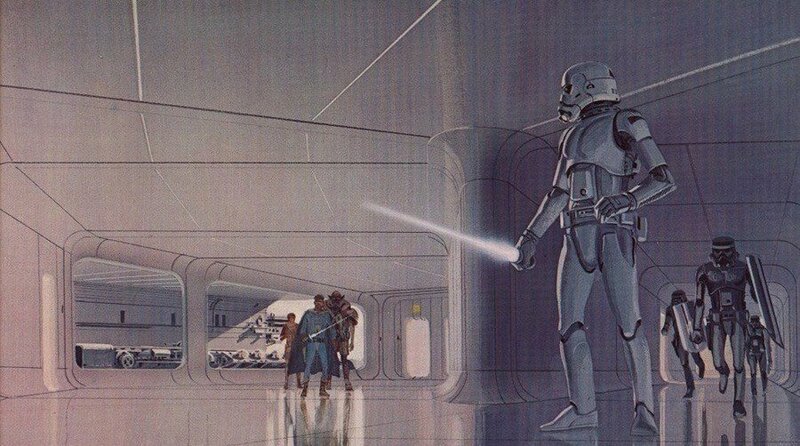 When George Lucas came to McQuarrie in 1975 and asked him to illustrate several of the scenes from the original script, McQuarrie’s drawings led directly to the visual design of many of the series’ main characters, including C-3PO, R2-D2, Chewbacca, and the most iconic villain of all time, Darth Vader. 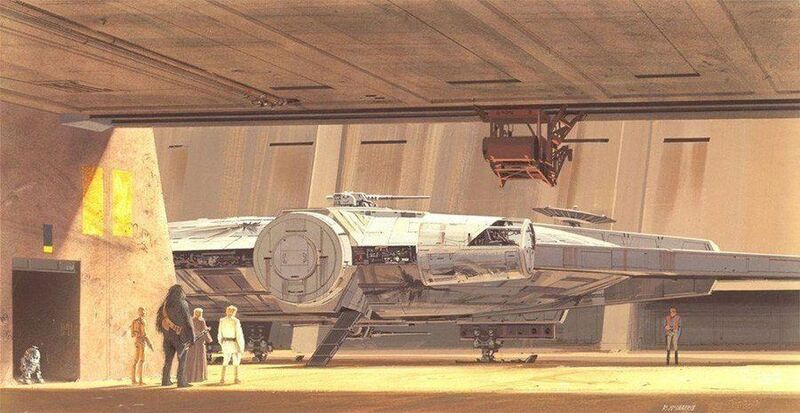 It was Ralph McQuarrie’s concept paintings that directly convinced 20th Century Fox to fund George Lucas’ sci-fi opus. The films that defined an entire generation may not exist today if it weren’t for these paintings and this man. 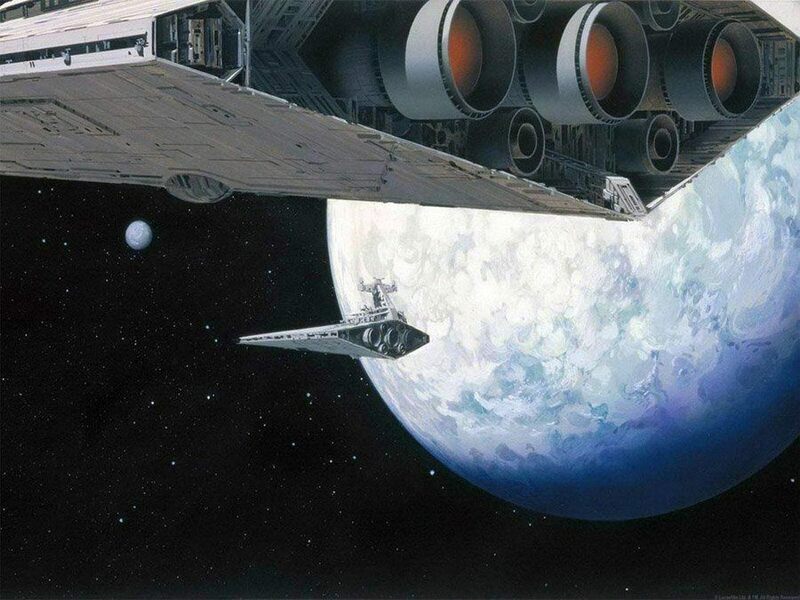 Of course, not every imagination from the concept paintings would make it to the final films. 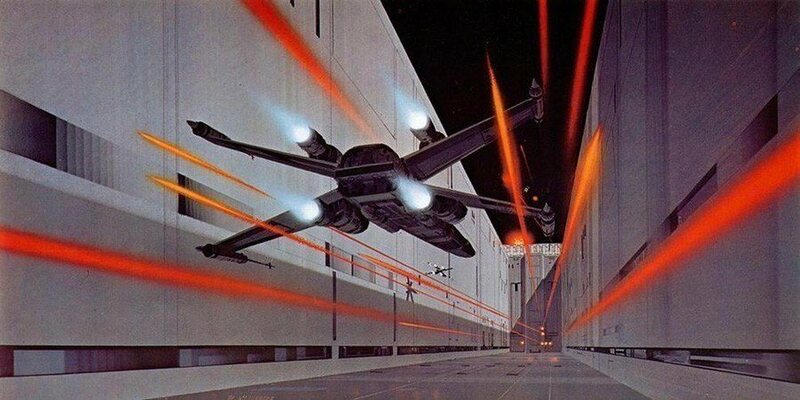 A TIE Fighter pilot takes aim at the rebels in the Millennium Falcon as it heads toward the Death Star. As with the characters, many of the designs of both ships and locations were modeled directly from McQuarrie’s imaginings. The grandiose locations and sets helped make the original trilogy the epic masterpiece which helped define a generation. The creatures designed by Lucas and McQuarrie are unique and lifelike; the worlds created and the beings within the series made it easy for audiences to suspend their disbelief and be carried away into the story. The paintings were able to give the sense of true motion; you feel pulled into the action that would later take place on screen. 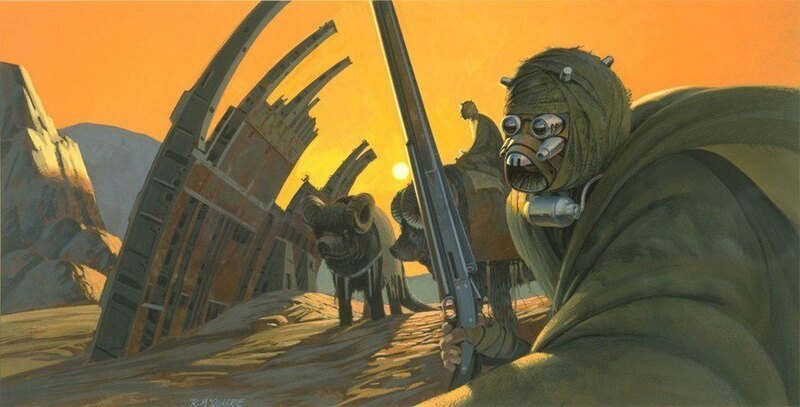 With the vast array of alien species that George Lucas required, Ralph McQuarrie had to have an imagination equal to that of the director in order to capture the vision. 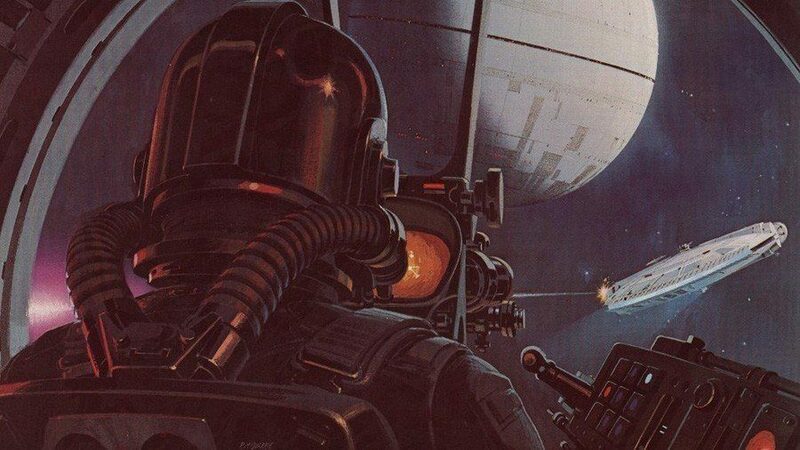 Not only did Ralph McQuarrie do the concept art for the Star Wars trilogy, he was also responsible for concept paintings for the original Battlestar Galactica TV series, E.T. the Extra-Terrestrial, and Cocoon, for which he won an Academy Award. 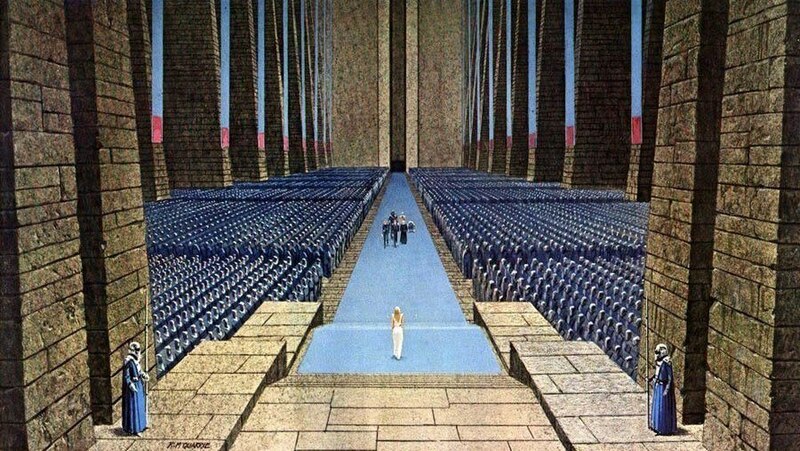 Concept art of the inside of Jabba’s Barge for Return of the Jedi. Luke’s snow speeder flies above the AT-AT Walker in the battle for Hoth. Luke Skywalker escaping the crashed snow speeder before the AT-AT Walker arrives. Imperial Star Destroyers drifting in space awaiting any fleeing rebel forces. Luke and Darth Vader fight shortly before it is revealed that the latter is the former’s father. Erin Kelly is a freelance writer, artist and video editor that splits her time between the humid Midwest and the dusty corners of her mind.